Deep Creek Marina, Perricoota road, Moama, NSW. Vessel operators are advised that a Special Event pursuant to Section 12(2) of the Marine Safety Act 1998 is to be held on the Murray River, near the township of Moama, from the Torrumbarry Weir to a point 500 metres upstream of the junction with Deep Creek from 6:00am to 6:00pm on Saturday 17 November 2018. Briefing will be conducted online. Please ensure that your membership and details are up to date with Ski Racing Australia. Briefing – will be available online for competitors from the 11th November 2018. Breath Testing and skier helmet check at the top of the ramp from 6.30am to 8.30am. 9.30am – Approximate start time – with boats travelling to Torrumbarry. Return time is dependent upon when all the boats are accounted for. Speed restrictions apply in Marina. Tow boats will be available to those that require towing out of Marina. Under NSW Roads & Maritime Aquatic Licence conditions, strictly no alcohol to be carried in boats and NO alcohol to be consumed until the boat has been retrieved by an crew members. Food & Drinks will be available at the Boat Ramp, Start – Finish area and at Torrumbarry Boat Ramp during the turnaround. 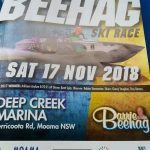 Presentation to follow directly after the race, after all boats have been removed at the Deep Creek Marina Hotel. Entry costs are $410 which includes the $182.50 SRA fee.